The Kimono (着物, きもの) is a traditional long-sleeve Japanese garment that reaches from the shoulders down to the heels. The word "kimono" means a "thing to wear" (ki "wear" and mono "thing"). In more recent years, the word has been used to refer specifically to these traditional Japanese full length robes. An Obi, which means "sash", is a belt tied around the waist of a woman’s Kimono to hold it in place. However, about 400 years ago, Obi was just a thin string used as a waist cord. The width of Obi become a little wider at the beginning of the Edo period (around 1600) and evolved into its current form in the middle of Edo period (around 1700). During the Nara period (710-794), Japanese people typically wore ensembles consisting of separate upper and lower garments (trousers or skirts) or one-piece garments. 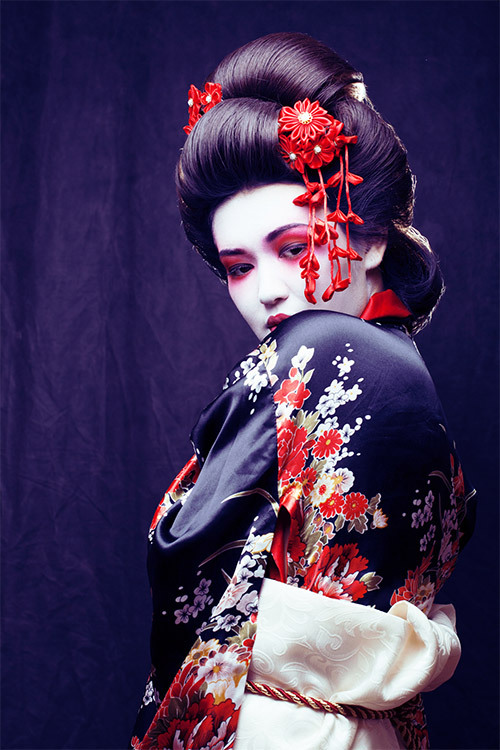 The first ancestor of the kimono was born in the Heian period (794-1192). Known as the straight-line-cut method, it involved cutting pieces of fabric in straight lines and sewing them together to create a garment that could fit every type of body shape. Straight-line-cut kimonos offered many advantages. They were easy to fold and suitable for all weather conditions. They could be worn in layers to provide warmth in winter and kimonos made of breathable fabric such as linen were comfortable in summer. 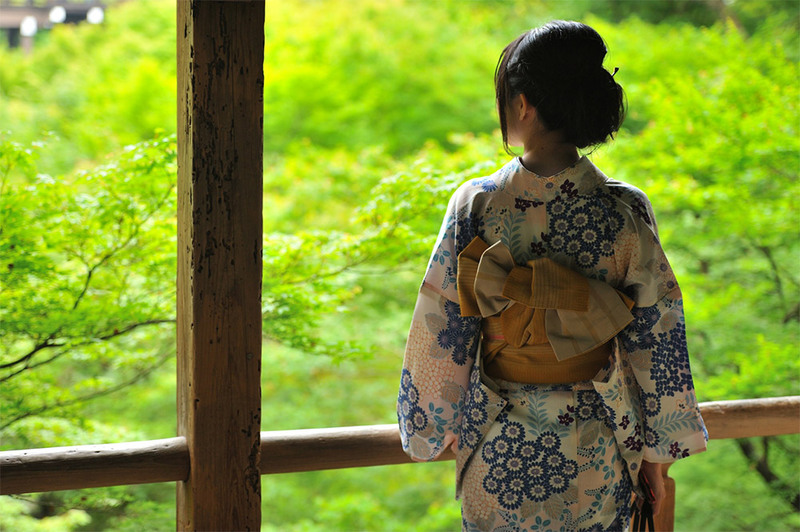 These advantages helped kimonos become part of the everyday clothing of the Japanese. During the Kamakura period (1192-1338) and the Muromachi period (1338-1573), both men and women wore brightly coloured kimonos. By the Edo period (1603-1868), designs had evolved into a unisex outer garment called kosode. Literally meaning "small sleeves," the kosode was characterized by smaller armholes. It was from the Meiji period (1868-1912) onwards that the garment was called kimono. At the time, Kabuki (song, mime, dance), the traditional drama performed by male actors, was popular among the people. Only male actors performed Kabuki due to a ban on female performers, despite a woman, Izumo no Okuni, being the creator and first performer of Kabuki. Male performers needed to emphasize feminine characteristics by wearing thick and attractive Obi to complement their Kimono when they played the role of a woman. Over time, as the practice of wearing kimonos in layers came into fashion, Japanese people began paying attention to how kimonos of different colours looked together and they developed a heightened sensitivity to colour. Typically, colour combinations represented either seasonal colours or the political class to which one belonged. It was during this time that traditional Japanese colour combinations developed. During the Meiji period (1868-1912), Japan was heavily influenced by foreign cultures. The government encouraged men to adopt Western clothing and habits. Government officials and military personnel were required by law to wear Western clothing for official functions; however, women were encouraged to wear the kimono. As Japan underwent fundamental changes during the Meiji period, Japanese women wearing kimono were a "reassuring, visual image". The kimono became "a visible yet silent link between woman, mother and cultural protector." The law forcing men and government officials to wear Western clothes no longer exists in Japan. 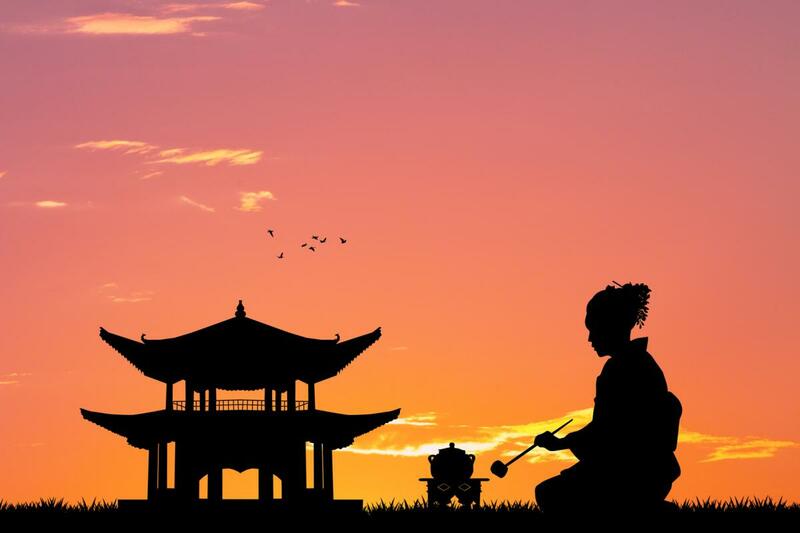 Nowadays, Japanese people rarely wear kimonos in everyday life, reserving them for occasions such as weddings, funerals, tea ceremonies or other special events such as festivals. At weddings, the bride wears a pure white kimono known as a shiromuku. Personal details and identifying factors of the wearer are suggested on the kimono in the fabrics, colours, patterns and details adorning the kimono's rich surface. Furisode is the most formal style of kimono worn by young unmarried women in Japan. The furisode is made of very fine, brightly coloured silk and is commonly rented or bought by parents for their daughters to wear when celebrating Coming of Age Day the year they turn 20. Throughout most of its history, the kimono has remained relatively consistent in its structure and silhouette. Unlike many Western fashions, kimonos "pay little mind" to the body shape of the wearer, instead hanging loosely and masking the figure beneath. The kimono shape rarely changes, regardless of the wearer's class, gender or position. Arctic Oriental creates cushions made from pre-loved Kimonos and Obis sourced from Japan. Each Arctic Oriental cushion is made from a Kimono or Obi that has experienced a previous life adorning a Japanese woman during her cultural activities and ceremonies throughout her life. This adds to the story of these unique cushions, a story you will be able to tell to friends when they ask about the beautiful unique cushions you have in your home.